The much-debated first 11 chapters of Genesis have incurred the most criticism from modern scholars, scientists, and sceptics. Proposals of proper interpretation have included looking at these chapters as poetry, parables, prophecy, letters, biography, or autobiography/personal testimony. So what is the biblical evidence to show that these first 11 chapters are actually a record of authentic historical facts? 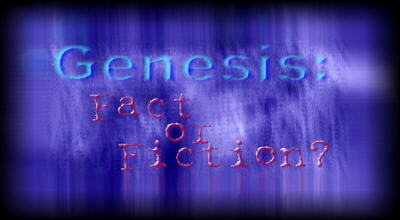 There is the internal evidence of the book of Genesis itself. As already mentioned, chapters 12-50 have always been regarded by the Jewish people as being the record of their own true history, and the style of writing contained in chapters 1-11 is not strikingly different from that in chapters 12-50. (c) Noah's flood was understood to be world-wide and extinguish all human and animal life except for those in the ark. Or, to put it negatively, the apologetic arguments which suppose the "days" of creation to be long eras of time, the figures of years not to be chronological, and the flood to be a merely local Mesopotamian flood, are not taken seriously by any such professors, as far as I know.' . One of the main themes of Genesis is the Sovereignty of God. This is seen in God's actions in respect of four outstanding events in Genesis 1-11 (Creation, the Fall, the Flood, and the Babel dispersion), and His relationship to four outstanding people in Genesis 12-50 (Abraham, Isaac, Jacob, and Joseph). There is thus a unifying theme to the whole of the book of Genesis, which falls to the ground if any part is mythical and not true history; on the other hand, each portion reinforces the historical authenticity of the other. . The principal people mentioned in Genesis chapters 1-11 are referred to as real - historical, not mythical - people in the rest of the Bible, often many times. For example, Adam, Eve, Cain, Abel, and Noah are referred to in 15 other books of the Bible. The Lord Jesus Christ referred to the Creation of Adam and Eve as a real historical event, by quoting Genesis 1:27 and 2:24 in His teaching about divorce (Matthew 19:3-6; Mark 10:2-9), and by referring to Noah as a real historical person and the Flood as a real historical event, in His teaching about the 'coming of the Son of man' (Matthew 24:37-39; Luke 17: 26-27). iii. God's redeeming purpose is consummated in Revelation 1-22. But why does mankind need to be redeemed? What is it that he needs to be redeemed from? The answer is given in Genesis 1-11, namely, from the ruin brought about by sin. Unless we know that the entrance of sin to the human race was a true historical fact, God's purpose in providing a substitutionary atonement is a mystery. Conversely, the historical truth of Genesis 1-11 shows that all mankind has come under the righteous anger of God and needs salvation from the penalty, power, and presence of sin. Unless the events of the first chapters of Genesis are true history, the Apostle Paul's explanation of the Gospel in Romans chapter 5 and of the resurrection in 1 Corinthians chapter 15 has no meaning. Paul writes: 'For as by one man's [Adam's] disobedience many were made sinners, so by the obedience of one [Jesus] shall many be made righteous' (Romans 5:19). And, 'For since by man came death, by man came also the resurrection of the dead. For as in Adam all die, even so in Christ shall all be made alive . . . And so it is written, The first man Adam was made a living soul; the last Adam was made a quickening spirit' (1 Corinthians 15:21-22; 45). The historical truth of the record concerning the first Adam is a guarantee that what God says in His Word about the last Adam [Jesus] is also true. Likewise, the historical, literal truth of the record concerning Jesus is a guarantee that what God says about the first Adam is also historically and literally true. If we apply the normal principles of biblical exegesis (ignoring pressure to make the text conform to the evolutionary prejudices of our age), it is overwhelmingly obvious that Genesis was meant to be taken in a straightforward, obvious sense as an authentic, literal, historical record of what actually happened. Copyright © 1997, Answers in Genesis, All Rights Reserved - except as noted on attached "Usage and Copyright" page that grants ChristianAnswers.Net users generous rights for putting this page to work in their homes, personal witnessing, churches and schools.